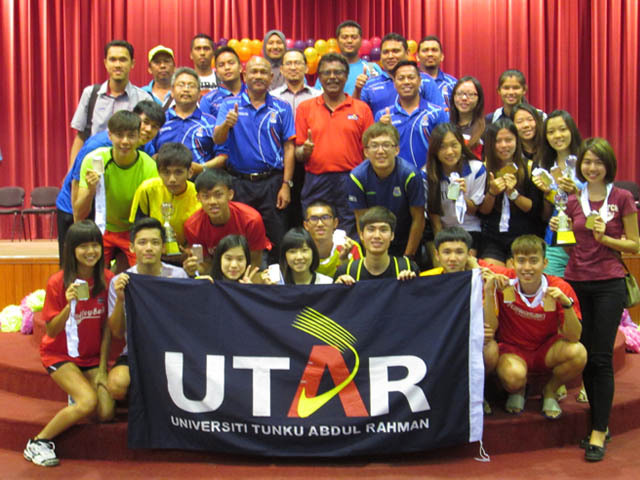 UTAR Perak Campus contingent achieved an excellent feat in winning a total of eight medals - three gold and five bronze in the Kejohanan Sukan Masiswa Zon Utara 2014 that was held at the Kompleks Sukan Universiti Teknologi Petronas (UTP), Perak from 7 to 9 November 2014. The tournament was a collaboration between the Ministry of Education (MOE) and Majlis Sukan IPTS Malaysia (MASISWA). Aimed at encouraging student’s participation in co-curricular activities, the tournament saw more than 300 student athletes from institutions of higher learning in the Northern Zone, competing against one another for the championship title. These participating institutions included UTP, UniKL MSI, UniKL MIMET, Tunku Abdul Rahman University College (TAR UC) Penang and Perak Branch Campuses, Kolej Universiti Islam Sultan Azlan Shah (KUISAS), Kolej Profesional MARA (KPM) Seri Iskandar, Kolej Poly-tech MARA (KPTM) Alor Setar and UTAR. UTAR Department of Students Affairs (Sports and Recreational Unit) Assistant Manager S. Theva Das led the contingent with 44 students including one international student. They participated in five of the seven events, namely, Netball, Rugby, Bowling, Futsal, Badminton, Volleyball and Chess. The three golds were from the female volleyball team who won the first gold medal for UTAR and two golds from the first female single and male double pair in badminton. The badminton players who contributed the two golds were Banking and Finance student, Kong Kah Yan in the first female single event and Banking and Finance student Kuey Wei Sheng and Foundation in Science student Koh Boon Chuen as the double pair players. Three challenge trophies were also awarded to these winners who secured gold medals. “It is an honour to play together with my amazing partner Wei Sheng. We always support each other in the game and give our best at the competition. Both of us are over the moon with the gold medal which speaks well for our badminton team and the University,” enthused Koh. The other five bronze medals came from the four medals won by the badminton team in the single male, second single female, double pair female and mixed double pair and the fifth medal from the male category of volleyball.